Megan Townsend received the Partners for Pollution Prevention Scholarship. This is the first year that the scholarship has been awarded. In the fall Megan will be a junior in EEE. Megan received the scholarship from the executive director of Partners of Pollution Prevention, Ben McKnight (photo on bottom right). 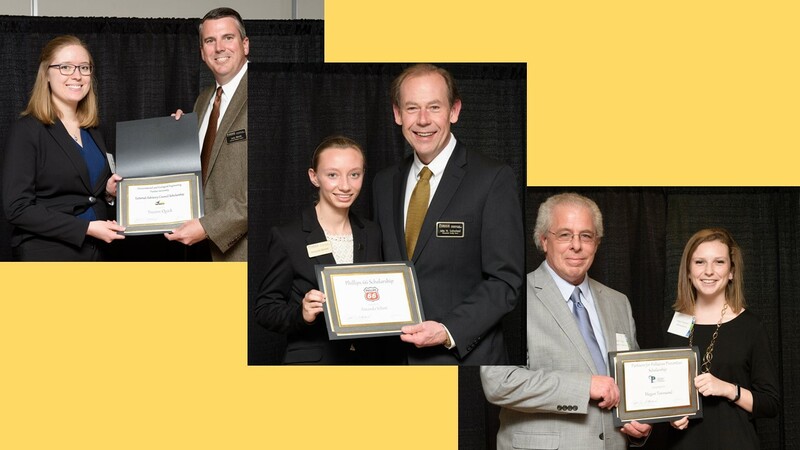 In addition, Amanda Schori received a Phillips 66 Scholarship for the past academic year. This is the first time that a Phillips 66 scholarship has been awarded to an EEE student. Amanda is an EEE senior graduating May 2017. The middle photo is the recipient Amanda and Prof. John Sutherland, Fehsenfeld Family Head of EEE.